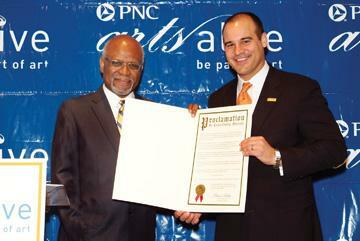 St. Louis County executive Charlie Dooley and PNC’s Rick Sems, following a May 19 proclamation of PNC Arts Alive Day. 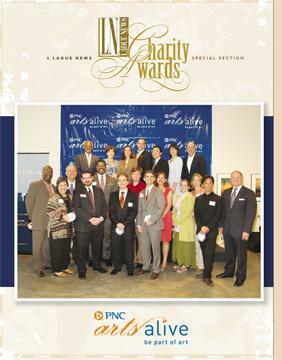 Pictured on the cover: St. Louis County executive Charlie Dooley, PNC regional president Rick Sems and St. Louis mayoral chief of staff Jeff Rainford with representatives from the 16 arts organizations receiving grants from Arts Alive. Perhaps a young child—never before exposed to the arts—hears Peter and the Wolf live at Powell Hall and develops a passion for music. Or maybe a first-ever trip to the Saint Louis Science Center inspires the curiosity to motivate a future chemist. Early childhood education can make the difference between a successful future and a lifelong struggle, and the initial investment benefits society with tremendous dividends. “Children from underserved communities typically start first grade 18 months behind and never catch up, because of the resources it would take for them to do so,” explains Rick Sems, regional president of PNC Bank. “For every dollar invested in early childhood education, society saves $16 in incarceration, rehabilitation and welfare payments.” The bank’s Grow Up Great program, funded by the PNC Foundation, works to improve children’s readiness for school. Grow Up Great collaborates with the Science Center, Saint Louis Art Museum, St. Louis Symphony and Missouri Botanical Garden. “Representatives from these groups come to the schools and work with the teachers to develop curriculums,” Sems says. “Maryville University acts as our consultant and we also work with Operation Food Search to provide nutrition for the kids. All of these groups are wonderful partners.” Currently, about 260 area children are enrolled in the program, he adds. Keeping the arts alive helps keep a community alive, says Sems. “There aren’t many cities in the country with the cultural institutions St. Louis has, and we want to make sure they stay vibrant by teaching them how to create additional revenue on their own. It’s seed money to help them tap into a new audience.” Recipients of this year’s grants include Jazz St. Louis, COCA, The Black Rep, Metro Theater Company and the Foundry Art Centre. SIDENOTE: This week’s LN cover features Restoring an American Treasure: The Panorama of the Monumental Grandeur of the Mississippi Valley at the Saint Louis Art Museum. Free admission to this exhibition is made possible by PNC Arts Alive. On the Cover: PNC Bank and the PNC Foundation’s Grow Up Great and Arts Alive programs provide funds for early childhood education and support of the arts in the St. Louis area. For details, call 898-1490 or visit pnc.com.